Add the chickpeas and BBQ sauce to a pot or pan on the stove top and simmer for about 10 mins. Partway through the cooking time, add in your arrowroot powder if you're using it. You don't need it, I just like adding it in to make it thicker. 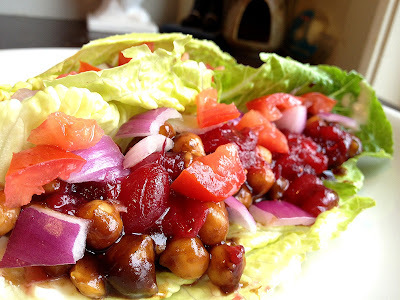 While your cranberry sauce is cooling, prep your veggies: lettuce, onion and tomato. Warm your wraps over the stove top or in the microwave if you're using wraps. Fill up the wrap as much as you can with all of your ingredients. Spread some veganaise on your wrap, about 2 tbsp of cranberry sauce, as much chickpeas as you can and toss your chopped veggies on top. Roll up and enjoy!